The nuclear disaster in Fukushima which followed in the wake of the 3/11 Tohoku earthquake and tsunami has given rise to one of the most significant public health crises in modern world history, with profound implications for how nuclear energy is perceived. This paper analyzes the most dire phase of the Fukushima nuclear crisis, showing how the level of risk was assessed by nuclear experts and state-level actors who worked largely out of view of public scrutiny. In addition to examining how the accident progression in the reactors was addressed and conveyed to the general public, the paper addresses how the exclusionary zones were determined by Japanese and foreign governments in Japan. As the crisis unfolded and efforts to bring the reactors under control were initially proving ineffective, concerns increased that the dispersion of radioactive fallout was unmitigated, and with radiation monitoring by the U.S. military indicating levels significantly beyond TEPCO’s conservative assessments, the United States broke with Japan, recommending an 80km exclusionary zone, and initiating military assisted departures for embassy staff and Department of Defense dependents from Japan. These actions deviated significantly from Japan’s assessments (which had established a 30km evacuation zone), creating a dynamic where the U.S. provided technical consultation for the nuclear response while striving to maintain a delicate diplomatic balance as they attempted to impose a qualitatively different crisis management response. Because this crisis had significant implications for Japan’s international relations, diplomatic considerations have helped to suppress the complex, often fractious relations between Japan and foreign governments – especially the United States – whose collective efforts eventually turned the tide from managing the nuclear meltdowns to ameliorating their long-term consequences. Based on interviews with political officials in both the Japanese government and foreign embassies in Japan, and nuclear experts and military officers who worked the crisis, the paper analyzes how technical assessments drove decision making and were translated into political policy. This paper analyzes institutional response to the Fukushima nuclear disaster, looking at how experts and key decision-making elites in the United States assessed the crisis and set policies as representatives of their organizations. In particular, it examines two related issues: the reactor meltdowns and the dispersion of radioactive fallout, and analyzes the political consequences of the divergent interpretations which developed in the first few days of the crisis around these issues. The framing of these central issues helped construct the general perception of risk that prevailed in this phase of the crisis, and provides a reference point against which to measure subsequent views as the crisis evolved over the longer term. The paper touches on the differences in perception between various foreign governments and examines the political implications of the crisis for international alliances in Japan. In addition to examining how the accident progression in the reactors was addressed and conveyed to the general public, the paper will discuss how the exclusionary zones and evacuations from areas in close proximity to the Daiichi Nuclear Power Plant (NPP) were determined by Japanese and foreign governments in Japan. As the crisis unfolded and efforts to bring the reactors under control were initially proving ineffective, concerns increased that radiation dispersion was significantly beyond what TEPCO was indicating, and as a result, the United States recommended an 80km exclusionary zone and initiated military-assisted departures for embassy staff and Department of Defense dependents from Japan. These actions deviated significantly from Japan’s assessments (which had established a 30km evacuation zone), creating a dynamicin which the U.S.providedtechnical consultation for the nuclear response whilestriving tomaintain a delicate diplomatic balance as it attempted to impose a qualitatively different crisis management response. This analysis is based primarily on in-depth interviews with diplomats in foreign embassies, military officials, journalists, nuclear scientists, and scholars, and examines how their collective narratives evolved in interaction with public sentiment as the crisis unfolded. The scope of the analysis is focused on the reflective perceptions of actors as they attempted to make sense of the crisis retrospectively after the 3.11 disasters. Because of diplomatic sensitivities and because some of the experts whose perspectives are represented in this analysis are constrained by organizational obligations that preclude them from revealing their identity, some of the sources remain confidential. In each case in which the identity of a source has been withheld, the information has been verified by independent sources. In the fitful hours after Japan experienced its largest ever recorded earthquake on March 11, 2011, the coastline of Tohoku lay in ruins from a tsunami that swept entire towns out to sea, resulting in the death of almost 20,000 people. As the world stood transfixed by the scale of devastation wrought by the tsunami, Japan ramped up its disaster management assets to address this crisis, coordinating its efforts with foreign governments and humanitarian relief organizations. While the international community initially mobilized to offer support for tsunami relief efforts in Tohoku, attention soon turned to the Daiichi nuclear power plant in Fukushima. In retrospect, the condition of the Daiichi plant in the most dire phase of the crisis seems readily transparent, as an unending litany of bad news has cast the situation in such continuing negative connotations that, like Chernobyl, Fukushima has taken on talismanic connotations to serve as a symbol of nuclear dread. But in the first few days of the crisis, with little meaningful information being provided amidst the disorienting impact of the earthquake and tsunami, and TEPCO offering assurances that were uncritically passed on by the government and a docile press, hope remained that the situation could be brought under control. This wishful thinking was soon made irrational by the explosion of the outer containment structure of reactor #1, which was so powerful (the explosion broke windows 3km from the plant) that both plant workers inside the Daiichi complex and nuclear experts watching from afar initially believed that the reactor core itself had exploded. With the explosion of the reactor #1 building there was no doubting the significance of this crisis, but calibrating the actual risk and danger that this presented to the general public was a moving target, with competing risk narratives that developed almost immediately after the initial news reports were released that the Daiichi and Daini nuclear power plants in Tohoku were in trouble. In the first few days of the nuclear crisis the information made available to the public was confusing, contradictory and frustrating. Despite a massive explosion that destroyed the outer, secondary containment structure of the Daiichi reactor #1 building, soon to be followed on the next day by a similar explosion of the reactor #3 building, TEPCO insisted that the primary reactor core containment was intact and that there were no releases of radiation that posed a threat to public health. Initially, conjecture held sway, with the foreign media challenging the Japanese press corps, who did little more than pass along TEPCO’s announcements, essentially serving as a PR agency for the utility. The Merriam-Webster dictionary defines the term “meltdown” as including “ the accidental melting of the core of a nuclear reactor;  a rapid or disastrous decline or collapse;  a breakdown of self control, (Merriam-Webster Dictionary, 2012), and the Oxford English Dictionary explains that “a meltdown was originally a catastrophic accident in a nuclear reactor, but this literal meaning has been swamped by the figurative sense of ‘a disastrous collapse or breakdown’. The term is now used metaphorically to refer to a chaotic loss of control, which is derived from the accidents at Chernobyl and Three Mile Island, where the reactors “ran away” from operator control, releasing significant amounts of radiation as a result of their errors. These accidents are now widely regarded as being the result of institutional failure, and TEPCO’s parsing of the term may have been a way to skirt the issue of responsibility by placing the emphasis only on the melting of nuclear fuel, rather than their own loss of control of the plant. Although the term “meltdown” is in common usage, and was invoked by the press almost immediately after the crisis began, within the scientific community this term is not recognized as a scientifically meaningful description. The term is not included in the International Atomic Energy Association’s 224 page “Safety Glossary” which enumerates terminology used in nuclear safety and radiation protection, and the term “partial core melt” is used only once to describe a Level 4 “Accident With Significant Off-site Risk,” as indicated by the International Nuclear Event Scale (INES), which charts the levels of magnitude of nuclear “events”. The scale is an indication of the inherent industry bias of technical description, denuded of adjectives or critical phraseology that might be construed as danger, emphasizing the more neutral notion of relative risk. The International Atomic Energy Association (IAEA) refers to this as “a simple scale, designed for promptly communicating to the public in consistent terms the safety significance of events at nuclear facilities” (my emphasis). On May 24, 2011 on the eve of a visit by an IAEA delegation, TEPCO officials announced that their data indicated that three of the reactors had in fact experienced meltdowns within hours of the loss of power following the tsunami. At this press conference, the issue of how this was previously characterized was revisited, with TEPCO now claiming that the meltdowns could only then be confirmed, and that they had previously suggested this possibility in reactor #1 on May 14, 2011. The media coverage of this revelation challenged TEPCO’s motives for revealing this information months after the fact, suggesting that this was in deference to international pressure, as a face-saving gesture directed toward the visiting delegation of IAEA ministers. Alternate media and independent reporters had been asserting the possibility of multiple meltdowns from the beginning, and while this possibility was presented by mainstream press as well, these stories were tempered by the acknowledgement that with no ability to see within the reactors, these scenarios were speculative at best. For nuclear experts, the debate over whether or not meltdowns had occurred was largely a political controversy being played out in the echo chamber of the mass media, as it was taken as a given that significant meltdowns had started early in the trajectory of the reactor accident progression (TEPCO would late specify that within 8 hours after the loss of power, meltdowns had occurred). In the scientific community it has long been recognized that at high temperature the zirconium alloy cladding that holds the fuel rods melts, leading to a chemical disassociation of the water molecules surrounding the fuel rods, releasing hydrogen and oxygen, which combines to form a highly volatile gas. Despite the venting of radioactive gases in the Three Mile Island (TMI) accident, the most ominous threat that the accident posed was a hydrogen explosion that could have blown the reactor out, leading to a catastrophic release that would have been much more severe than what actually transpired. Through intense scrutiny it was determined that the infamous hydrogen bubble that built up inside the reactor #2 building at TMI could not explode due to a lack of oxygen, and remedial efforts were able to reduce the size of the bubble until it was no longer a threat. But in Fukushima, the powerful explosions that destroyed the buildings housing the Daiichi reactors could only have happened if a core melt was significant enough to release high levels of hydrogen gas, and the subsequent explosions were proof positive that catastrophic meltdowns had already occurred. As a result, while the media debated the relative chances of a meltdown and quibbled over the nomenclature, the nuclear experts who worked the crisis knew early on unambiguously that the Daiichi plant was in deep trouble, and mobilized their resources accordingly. As the Daiichi plant’s condition rapidly deteriorated, it became clearly evident that the situation was beyond the control of the TEPCO administrators, which undermined their authority, lending credence to the widespread perception that they were not forthcoming with information. Government officials and TEPCO spokesmen claimed that they had been withholding this information in order to prevent panic in the early days of the crisis, but this revelation was taken as evidence that officials were deceiving the public and that TEPCO was more concerned about protecting its investments than it was in ensuring public safety. For the foreign press, the devastation of the tsunami was the initial focus of coverage, diverting attention from the nuclear crisis, which in the first few days remained opaque, while the implications of the tsunami were clearly evident. Although major media conglomerates such as Reuters, The Wall Street Journal and the Associated Press had the resources to divide coverage between the two conjoined disasters, other major media organizations such as the New York Times, The Times of London, the BBC and CNN have scarce resources on the ground in Japan (most of the Asia bureaus for major media outlets have moved from Japan to China in the last decade), and the senior editors for these publications were mobilized to the coastland of Tohoku to cover the tsunami. The media followed a pattern that played out in the foreign embassies in Japan as well, in which nuclear experts in their home countries provided consultation for assessing the situation. But while these authorities may have had considerable experience dealing with nuclear issues, they had virtually no culturally contextualized knowledge of Japan, and in the short-term had no access to more nuanced local information of what was transpiring at the Daiichi plant. Organizational elites, both in the diplomatic corps and in the foreign media, relied primarily on the Japanese mainstream media for more specific information, tempering this with the widely divergent, often random reports that were filtering out through social media, which, being less constrained by organizational vetting and mainstream considerations, tended to be more alarmist, amplifying the analysis to interpretations that often were dismissed because they were at the time unwarranted by the facts (which, after all, were not available at that time). In retrospect, many of these reports have been vindicated by information that has gradually become available as a series of revelations by disgruntled former industry officials, retired government authorities and scholars has given credence to views that had previously been seen as overwrought. At Three Mile Island, it was not until three years after the accident that plant managers were able to look into the reactors and determine that the core of reactor #2 had melted down. At Fukushima, with a station blackout and the plant in disarray as staff frantically tried to recover power, the situation in the first days of the crisis remained fluid, with little meaningful information to convey. If the actual situation was unclear to workers inside the plant, it was entirely opaque to those outside, including the diplomatic corps at embassies in Japan and nuclear authorities from abroad, who were pressing the Japanese government to provide specific information. In addition to concerns about what was developing inside the reactors, a central issue of risk assessment – and trust – was related to the spread of radioactive materials disseminating from the plant. After a frustrating delay in venting reactor #1 that pitted Prime Minister Kan against a recalcitrant TEPCO management that was internally divided and uncooperative, evacuations from nearby the plant commenced with little government guidance and no information made available that could help guide prefectural authorities in their actions. The Japanese government had established a computer modeling “System for Prediction of Environment Emergency Dose Information (SPEEDI)” in 1980, following the Three Mile Island nuclear accident, to provide detailed computer modeling projections of how weather patterns dispersed radioactive fallout into the environment. Although the system was operative throughout the Fukushima crisis, it was not properly utilized for its intended purpose. Technically, the system relies on data from the source of a radioactive release to determine the amount of radioactive materials that are escaping into the environment, which is then modeled through computer algorithms to indicate where the radioactive plume will be dispersed by the weather into the surrounding area. This is a complex assessment, relying on an estimate of the level and composition of radioactive isotopes that must somehow escape containment (via venting or, in the Daiichi crisis, hydrogen explosions), and a calculation of where this radioactive plume will be carried by shifting winds and modulated by precipitation effects. Under laboratory conditions, precise values may be factored into the equation, but in the chaos of the Daiichi crisis, little information was available to factor into the equation. Although fixed station radiation monitoring posts continued to stream data throughout the duration of the crisis, with the loss of instrumentation due to the station blackout, the most important data of radiation readings in close proximity to the Daiichi plant was not made available in a timely manner that could have been factored into the SPEEDI system to make it functionally operable. Stunned into inaction by the severity of the accident and the ensuing chaos, and unwilling to stake their claims on a system that was deemed to be untrustworthy due to incomplete information, Japanese authorities did not utilize SPEEDI to factor its results into evacuation orders. As fears about the reactors heightened and TEPCO prepared to vent reactor #1, on March 12 the government evacuated four towns located nearby the reactors, increasing the evacuation zone from 2km, as decided in the evening of the previous day, to 10km (6.2 miles, cf. Table 2). Two of the towns – Futaba and Okuma – were assisted in the evacuation, with the government providing buses to transport citizens. Despite this initial support, refugees from Namie and Tomioka, who were in evacuation areas initially only 8km (4.4 miles) from the plant, were thereafter left to fend for themselves with neither direction nor support offered by the Japanese government, and fled northwest, right into the path of the radioactive plume, just where SPEEDI, had it been implemented, would have predicted the fallout would go. This scandal firmly linked the Japanese government to TEPCO as corrupt and incompetent on fundamental issues of radiation assessment. Whereas the hapless handling of the reactors had been attributed to a lack of regulatory oversight that prefigured TEPCO’s chaotic response to the disaster, the SPEEDI scandal was seen as being the result of incompetence at the highest levels of government, betraying a lack of concern for the people most at risk from the nuclear disaster. In the first couple of months after 3.11, the public inclination was to still trust what the government was saying and what the media was describing, but that started to breakdown by May, and that was reflected in public opinion polls at that time. Elements of this story had already been covered in the Japanese media, dating to April, 2011, when Kosako Toshiso, a former professor at the University of Tokyo and member of the government’s impromptu advisory group on radiation, resigned in protest over the government’s mishandling of SPEEDI, linking it to subsequent arbitrary loosening of radiation danger threshold standards. Kosako’s resignation was the first significant crack in the public façade being maintained by the government, and this story increased in significance as it was associated with government deception and collusion. By April, an Asahi Shimbun public opinion poll indicated that only 21% supported the Kan administration with 60% opposed, and in response to the question “Do you think the government’s dissemination of information about the accident in the Fukushima Daiichi nuclear power plant was appropriate?” only 16% answered in the affirmative, with 73% saying that it was inappropriate. With the SPEEDI data, it appears that social media was instrumental in making the system known outside a small circle of bureaucrats who were reluctant to act on the information, and who themselves were not initially aware of the database because this information was compartmentalized in other offices and no one was discussing it. With no one asking the right questions to the right people, the information lay dormant. The SPEEDI data was not initially conveyed to local officials in Fukushima, but was known to some Japanese government officials in the Ministry of Education, Culture, Sports, Science and Technology (MEXT), the government office under which SPEEDI is administered. Although the staff who were compiling the information for the SPEEDI computer modeling had data in-hand by the first day of the accident, they withheld the predictions, claiming a lack of certainty about its accuracy due to incomplete data (the model depended in part on data from the nuclear plant, but with the power supply down, this was not available to factor into the overall assessment). Yahoo Japan had recommended Hayano on their top-page as a person of note shortly after the nuclear crisis began, and thereafter, his following grew exponentially to reach a broader public audience. These Twitter posts also came to the attention of Shikata Noriyuki, who at the time of the nuclear accident was Deputy Cabinet Secretary for Public Affairs and Director of Global Communications at the Prime Minister’s Office. Secretary Shikata informed Deputy Chief Cabinet Secretary Fukuyama Tetsuro on March 15 and information about SPEEDI was then conveyed to the U.S. Embassy and military through the Ministry of Foreign Affairs. SPEEDI was not revealed officially to the general public until March 23, but by then, information about this system was spreading through social networks and into the mainstream media. Ironically, while TEPCO was “drowning journalists with data” (as Christoph Neidhart, the German daily Sueddeutsche Zeitung Tokyo bureau chief who attended their daily press conferences put it),8 Hayano’s Twitter posts reached a large and diverse audience, and was all the more persuasive because of its brevity. Where it not for Hayano, cogently encapsulating complex technical information into 100 character tweets and talking with the appropriate officials, the information may not have come out. The SPEEDI contretemps, as with the divergent interpretations about the condition of the reactors previously discussed, indicates the complexity of how information develops and is utilized in complex, “normal accidents”. The multiple government and embassy offices, rather than being integrated under a common chain of command as part of an integrated crisis management system, compartmentalized information in silos, not only ineffectively communicating outside their respective bureaucracies, but often not discussing important facts even among themselves. The press helped link these together, as it pushed and prodded for information, compelling officials to explain their actions and account for their policies. While the Japanese press attempted to burrow down into the details of the organizational chaos, the foreign press continued to amplify the crisis, framing it in terms that would appeal to foreign viewers who were distracted from the tsunami because of the crisis and disinterested in the internecine politics of obscure bureaucratic officials. Taken together, these combined into a compelling narrative arch, as the Japan-based journalists revealed bureaucratic ineptitude that provided a grounding in reality to the more critical views that were gaining traction. Lacking contextual perspective, and with scarce information available in any case, the foreign press played up fears of apocalyptic doom. Lacking information about what was really transpiring at the Daiichi plant and living through the uncertainty and chaos in those early days after the earthquake, the local press looked for explanation in the actions of specific organizational elites, and found little of worth. These views aligned in the assessment of foreign authorities, who, doubting the information they were receiving, began to distrust the leaders who were providing it. The controversy over the SPEEDI data was later compounded by the disclosure that on March 14 this data, which had been withheld from local Japanese officials and those in the path of the fallout (the Japanese public did not find out until 9 days later), had been released in hourly reports to the U.S. embassy and military who were working on relief efforts in the area. For many, this hardened views that TEPCO and the Japanese government were more concerned about vested interests and state-level political concerns than they were about the well-being of their most vulnerable citizens. It also raised questions about what was really transpiring behind the scenes while these entities ineptly attempted to manage the story and project an increasingly implausible facade of control. In the immediate aftermath of the tsunami, an unprecedented relief effort comprised of domestic and international NGOs, unaffiliated citizen volunteers, and government associated organizations from 116 countries descended on Japan to provide disaster relief in the Tohoku region. This impressively international outpouring of support demonstrated genuine humanitarian concern, and it cast the most unambiguously positive light on the 3.11 crises disaster response. While initially these tsunami relief efforts stood as a salutary example of international cooperation, as the nuclear crisis unfolded and eclipsed attention on the aftermath of the tsunami, this narrative turned toward one of confusion, suspicion and deceit, with TEPCO – and, by association, the Japanese government – being cast in a negative light, not only by Japanese citizens, who were increasingly feeling misled by government authorities, but by foreign governments, who were frustrated by the lack of information being provided by TEPCO and Japanese government officials about what was actually transpiring at Fukushima Daiichi. Because of its long-standing strategic political alliance with Japan, buttressed by the largest array of military bases outside the continental U.S. and the only forward-deployed nuclear aircraft carrier group in the U.S. military, the United States was the most significant foreign responder in tsunami relief efforts and provided the most meaningful consultation and logistical support in the nuclear crisis. The U.S. Pacific Command (PACOM), working in coordination with USAID and other federal agencies, was intimately involved in relief efforts in Tohoku from the beginning, and working closely with the Japan Self-Defense Forces (SDF), were significant first-responders to coastal villages that had been swamped by the tsunami. These joint operations in total involved 140 U.S. aircraft, 19,703 personnel and over 20 American naval ships, which represented a significant portion of the U.S. 7th fleet Naval Forces. U.S. troops participating in Operation Tomodachi (Friendship) worked in close coordination with the Japanese Ministry of Defense and SDF, a rare moment in the often fractious relations the U.S. military has experienced in Japan. Japanese public sentiment toward the U.S. soared as a result, with 84% of Japanese polled in the Cabinet Office’s annual report saying they had friendly feelings toward the United States, the highest tally by far since the survey began in 1978. These findings were replicated in a poll commissioned on June 9 by Japan’s Foreign Ministry (84% approval), and in a Pew Global Attitudes poll (85% approval) taken on June 1, 2011 which found similar results. The U.S. government and military support for tsunami relief efforts through Operation Tomodachi have garnered considerable attention, but less is known about the role the U.S. military played in helping to respond to the Fukushima nuclear crisis. With the Sendai airport rendered inoperable by the tsunami, the U.S. Navy’s Ronald Reagan aircraft carrier group, parked off the coast of Fukushima, served as a fueling platform and staging area for tsunami relief, at which time military personnel were exposed to radiation emanating from the reactors. As the wind was blowing out to sea for the first couple of days after the onset of the crisis, aside from local communities near the Daiichi facility, servicemen on this nuclear powered aircraft carrier were among the first to be exposed to the radiation plume from the explosion of the Reactor 1 building on March 12. The exposure levels both on the ship and on the shoes of US servicemen who had temporarily landed on a Japanese command ship at 50 nautical miles from the plant were unexpectedly high, provoking the carrier group to back off from 60 to 180 nautical miles from the plant. ADMIRAL DONALD: (…) Earlier this evening, as the USS Ronald Reagan was operating off the coast of Japan, we – the ship just arrived. We had given the ship some guidance as far as positioning was concerned to stay clear of the area of the potential plume, basically told her to stay 50 miles outside of the radius of the — 100 miles — excuse me — 50 miles radius outside of the plant and then 100 miles along the plume with a vector of 45 degrees. The ship was adhering to that requirement and detected some activity about two and a half times above normal airborne activity using on-board sensors on the aircraft carriers. So that indicated that they had found the plume and it was probably more significant than what we had originally thought. The second thing that has happened is we have had some helicopters conducting operations from the aircraft carrier and one of the helicopters came back from having stopped on board the Japanese command ship in the area, and people who had been on — were on the helicopter who had walked on the deck of the ship, were monitored and had elevated counts on their feet, 2500 counts per minute. But I wanted to get you guys on the line and my expert on the line so we can get the data and then the proper people notified. MR. PONEMAN: Okay, I have a couple of questions. Number one, in terms of the level of radiation that you are picking up, what’s the delta between that and any information we have from the Japanese or other sources of what the level of radiation would be, given the venting and so forth that we know has occurred? MR. MUELLER: So — this is Mueller — the sample that was taken and then what we detected, we were 100 nautical miles away and it’s — in our terms it’s — compared to just normal background it’s about 30 times what you would detect just on a normal air sample out at sea. And so we thought — we thought based on what we had heard on the reactors that we wouldn’t detect that level even at 25 miles. So it’s much greater than what we had thought. We didn’t think we would detect anything at 100 miles. MR.. PONEMAN: You didn’t think you’d detect anything at 100 miles. Okay, and then in terms of the regulations and so forth of people operating in these kinds of areas, I forget some you know, acronym for it, PAG (Protective Action Guidelines) or something, how do the levels detected compare with what is permissible? MR. MUELLER: If it were a member of the general public, it would take — well, it would take about 10 hours to reach a limit, a PAG limit. MUELLER: Right. For a member of the public. PONEMAN: Right. You mean, at the level you detected? MR. MUELLER: Yes sir. But 10 hours, it’s a thyroid dose issue. MR. PONEMAN: Okay, but the net of all this is that the amount of release that is detected by these two episodes whatever you would call them, is significantly higher than anything you would have expected what you have been reading from all sources? MR. PONEMAN: Tell me again exactly how you picked up these two forms of samples. MR. MUELLER: We have automatic detectors in the plant that picked up — picked up the airborne, and all of our continuous monitors alarmed at the same level, at this value. And then we took portable air samples on the flight desk and got the same value. ADMIRAL DONALD: These are normally running continuous detectors, continuous monitors that run in the engine room all the time, monitoring our equipment. MR. PONEMAN: These are detectors on the Reagan? ADMIRAL DONALD: On the Ronald Reagan, correct. MR. PONEMAN: On the Ronald Reagan. They are there because you have got equipment there that you know, it could emit stuff and while you were there, you picked up stuff that was ambient which indicated that you actually were in the plume? MR. PONEMAN: And this was — this was 30 times higher than what you would have expected? With the Daiichi plant still a black box, and only spotty data to indicate the radiation dispersion, the U.S. quickly set up an independent parallel process of acquiring data, utilizing their vast array of military and governmental resources. These included the Department of Energy’s Atmospheric Monitoring System (AMS), on the ground radiation measurement surveys, fixed station radiation monitors, the RQ-4 Global Hawk military drone and classified military surveillance (the Lockheed U-2 high-altitude reconnaissance aircraft and the P-3 Orion maritime surveillance aircraft) and the nuclear aircraft carriers to help with the assessment. In order to make sense of this data, the U.S. relied on Nuclear Regulatory Commission (NRC) administrators, who coordinated with the Department of Energy and the National Atmospheric Release Advisory Center at the Lawrence Livermore National Laboratory in California, analysis by Naval Reactors’ experts at their research labs (comprised of approximately 6,000 staff), and an ad hoc collection of loosely affiliated former government specialists, retired military officers (nuclear engineers), scholars and former NRC staff. In order to consolidate these resources into an integrated command structure, the U.S. embassy in Tokyo conceived a “Bilateral Assistance Coordination Cell” (BACC), which met daily and included all USG agencies. Through diplomatic channels, with U.S. Ambassador John Roos representing the State Department, the U.S. attempted to coordinate its response with the Japanese government. This had started soon after the onset of the crisis, focusing on tsunami relief efforts as the Japanese Self Defense Forces (SDF) and the United States Forces Japan (USFJ) developed joint operations using both U.S. and Japanese military bases as staging grounds for mounting their operations. With a keen eye on the diplomatic implications of the crisis, state-level actors took pains to highlight mutual cooperation, despite frustrations that developed backstage as the power outage at the Daiichi plant developed into a full-blown crisis. Until the U.S. nuclear authorities who were deployed to Japan were able to establish a working relation with TEPCO, they relied on information filtered through the Japanese government, which in the first few days was scarcely available: the only real-time information the U.S. had access to was a data stream on the MEXT website, and second-hand reports from NISA and other Japanese government agencies. At this time even the Japanese government did not know how bad the situation was, since TEPCO was downplaying the magnitude of the crisis even while the situation at the Daiichi plant continued to deteriorate. Prime Minister Kan Naoto would eventually lose his job to the crisis, as confidence in the government plummeted, but in the early days of the crisis, he was notable for challenging the TEPCO officials, chastening them to be more forthcoming with information, and demanding action in the face of their intransigence. In June 2011 it was revealed that even though he had ordered them to dump seawater into the reactors, the TEPCO officials defied this order, realizing that the saltwater would render the reactors unusable, and the plant a total loss.The reactors were brought under tenuous control only when Yoshida Masao, the plant manager, ignored orders from his superiors and inundated the reactors. The conflict between the Kan administration and the TEPCO officials reached an apex on March 15th, when TEPCO’s president Shimizu Masataka announced that TEPCO intended to withdraw from the plant due to the increasing radiation exposure to its employees. Kan’s insistence that TEPCO maintain operational control at the plant site may have prevented a much larger catastrophe. When TEPCO asked permission to withdraw from the plant, they may have been indicating that they were merely relocating to an operational center outside the plant, with a skeleton staff of workers to remain at the Daiichi Facility to monitor equipment and implement actions that could only be done on-site.10But to Kan, who had already endured TEPCO’s inordinate delay in venting reactor #1 and defiance in putting saltwater on the reactors, this alleged strategic disencampment to a facility off-site was the culmination of conflict that had started within hours of the plant blackout, and was taken as an abandonment of responsibility. The question of whether TEPCO intended to entirely abandon the plant or only partly withdraw remains unresolved. The March 2012 “Rebuild Japan” independent report on the Fukushima crisis by a group of former government officials discusses this issue at length, and while they note that various parties indicated that they thought TEPCO was signaling total withdrawal, TEPCO officials contest this claim and after careful consideration, the report – and other subsequent governmental and independent reports -leave this matter unresolved. In retrospect, the true intentions of TEPCO remains obscure, but this dispute was important because it demonstrated that PM Kan did not trust TEPCO to fulfill their duties, and it established a dynamic of accusation and distrust between the principal players and organizations at the center of the crisis. In subsequent reports both governmental and independent panels accused Kan of micro-managing the crisis, by intruding on the plant administrators charged with handling the situation, blurring the chain of command and unduly complicating decision-making at the worst possible time.Had the situation been under even tenuous control, such accusations might seem warranted, but there was scant indication that TEPCO had the situation in hand, and even with their active involvement, the situation continued to deteriorate and appeared to be sliding toward a catastrophic disaster that threatened the entire country. Irrespective of the validity of these competing claims, both the Kan administration and the U.S. government experts who were monitoring the situation were convinced that TEPCO was intending to withdraw from the site, and exerted considerable pressure on TEPCO to remain, with Kan essentially requiring them to maintain sufficient staff to manage the operation. The implications for this were dire for the TEPCO staff, as the magnitude of the nuclear accident was growing more ominous, with no resolution in sight, and the remaining staff faced the prospect of lethal doses should they remain. Given the stakes involved, and as a way to provide legal cover for the implications of consigning plant workers to die on the job, the Japanese government simply raised the official threshold standards – the maximum legally allowable dose – for radiation workers at the plant. By utilizing deeply rooted sentimental notions of obligation, the “Fukushima Fifty” (actually there were seventy five workers who remained; the “Fukushima Fifty” was a snappy media created alliteration that helped sell the story) who remained were enlisted in service of a heroic trope that put a human face on TEPCO and allowed the Japanese government to claim the moral high ground (at least over TEPCO), while providing a means of addressing the crisis at the most crucial moment. It was into this fracas that the U.S. and the other principle players involved in the crisis entered as they futilely attempted to glean information upon which they could make an assessment that would productively orient their actions. Foreign entities who were frantically trying to gather information saw a demoralizing situation: a utility who had lost control of the plant, who seemingly were incapable of taking effective remedial action and who were fighting with the Japanese government while the plant reactors fell like dominos, with no end in sight. Within hours of this, the U.S. authorities became convinced that TEPCO was intending to leave the plant. The prospect of TEPCO withdrawing from the plant focused everyone’s attention, as this would have truly been the nightmare scenario that alarmist pundits had been suggesting. Had TEPCO withdrawn operational staff from the Daiichi facility, all the reactors and spent fuel pools would have eventually melted down, releasing such severe levels of radiation that eventually the staff at the Daini facility (located 11.5 kilometers south of the Daiichi NPP) would also be forced to withdraw, with the result being that all the reactors and spent fuel pools at this plant would also have melted down. Given the fact that the spent fuel pools contain approximately 5 – 6 times more radionuclides than a working reactor, this would have been orders of magnitude more severe than the Chernobyl accident. It was with this in mind that the Japanese government discussed evacuating Tokyo. Alarmed at this possibility, in the U.S. embassy planning began to put thousands of Americans on the decks of the aircraft carriers to get them out immediately. For the U.S. government, this would have jeopardized their ability to maintain the military base structure in Japan in the long term, an unthinkable prospect that would have compelled them in the short term to fully engage in the task of sorting the reactor crisis (despite the prospect of incurring lethal doses in the process), in coordination with the Japanese Ministry of Defense. Despite PM Kan’s rage at TEPCO’s defiance, from the vantage point of American radiation experts who were looking at the dramatically rising radiation levels, neither TEPCO nor the Japanese government fully appreciated the implications of TEPCO’s announced withdrawal. Although this has not yet been revealed to the public due to diplomatic sensitivities, backstage a series of contentious communications passed in short order between the U.S. Pacific Command (PACOM), the U.S. State Department (via U.S. Ambassador Roos), the Japanese Ministry of Foreign Affairs, the Prime Minister’s office and TEPCO about the implications of TEPCO leaving the plant. In response to diplomatic pressure from the U.S., along with the recognition of what this might forebode for the SDF and the American military forces in Japan (and therefore the US-Japan Alliance), Kan flatly demanded that TEPCO officials remain at the plant. 1) This remains a Japanese response and NRC’s role will be to support the Japanese Emergency Responders in a manner that is appropriate. We have now been asked by Japan to provide assistance to their Regulatory authorities and other emergency responders. This was undoubtedly an extremely difficult decision for the Japanese who had up to this point been among the top nuclear leaders in technical expertise, especially in seismic and tsunami matters. The Japanese are now in their fourth day of responding to these emergencies and will remain the best informed about the current technical, legal, cultural, and regulatory issues. NRC can be of enormous assistance taking into consideration that we can help augment their already burdened staff. We must be sensitive to their needs and not interfere with their decision-making. Recognizing that if we interfere, rather than assist, the consequences could be enormous. It will be essential to help the Japanese maintain trust in their leaders to promote ongoing civil order in response to the nuclear crisis. Any inconsistencies or statements that undermine Japanese authority or expertise will have lasting affects as it could hamper current emergency efforts and their future ability to respond to these issues, long after international assistance recedes. Any interactions with the Japanese, other nations or public communication should take this into consideration. It remains crucial that we build upon our long-standing cooperative relationship with the Japanese regulators. The NRC has a vast amount of expertise working with the Japanese program and personal relationships that should be used as a basis for strengthening, rather than shaking the confidence of the Japanese responders. There should be sensitivity to not question the past actions, as there will be ample time to learn from these experiences. Direct confrontation will also not be helpful. Multiple agency questions and interactions are an unnecessary distraction. While the U.S. diplomats and government agencies finessed the need to maintain good diplomatic relations while taking measures to protect U.S. citizens in Japan that eventually diverged from the Japanese response, the U.S. military was less concerned about political niceties than it was about force protection and defending their nuclear interests in the region. Had Kan not forced TEPCO to stay, an entirely different political dynamic would have ensued, with the U.S. government taking on a more central role in coordination with the Ministry of Defense and the SDF. Despite having some of the most sophisticated military assets in the world, the SDF is not a nuclear force: they have neither the experience nor corresponding expertise to sort such a complex nuclear disaster. The U.S. Navy, by comparison, owns approximately half of all the operational hours of nuclear reactors in history (approximately 6200 reactor years of operation), having been the first military force to deploy nuclear carriers and submarines – laden with nuclear weapons – with all the expertise that entails. And, they are there: the infrastructural footprint of U.S. military bases in Japan has been the bane of US-Japan public relations since the Pacific War, but these bases would have provided the U.S. with the necessary resources to mount the campaign, had it proved necessary. As a result, the U.S. would have undoubtedly taken technical lead in the crisis, having the SDF serve as proxy in order to protect the notion of Japanese state autonomy and in order to avoid throwing American soldiers on the nuclear pile. The Japanese Foreign Ministry and the U.S. State Department were well aware of these political implications and strove to avoid a public diplomatic row. By convincing TEPCO to remain, the U.S. and Japanese governments were able to have it both ways, with the U.S. providing crucial technical consultation but at an appropriately delicate diplomatic distance that allowed Japan to save face while taking the appropriate mitigating actions without the U.S. appearing to be puppet-master over a dependent client state. In the first week of the crisis, a series of setbacks upped the ante, making it difficult for the NRC to remain in a passive, exclusively advisory role. Having just arrived in Japan a couple of days after the crisis began, and thus not being initially privy to the level of disagreement between TEPCO and the Japanese government, they engaged the situation at the worst possible moment, just as TEPCO announced its plans to leave the plant, and only shortly after TEPCO had defied orders to vent the reactors and put water into the cores to prevent the reactors from spinning entirely out of control. The 16th of March was the longest day of the nuclear crisis. After the reactor #4 building exploded, debate centered on the condition of the spent fuel pool (SPF), which was worrisome because the spent fuel rods that had recently been cycled into storage were especially toxic. The condition of SPF 4 became a major source of contention between TEPCO and the NRC, as the Japanese authorities insisted that water remained in the pool, based on inferred technical information and on a video taken during a helicopter fly-by, which seemed to show reflection off water. The NRC experts were not persuaded: the video was scarcely one frame on a monochromatic screen that could have been a reflection off of materials that had been scattered when the building that contained the pool exploded. And in any case, this was not a firm enough basis to wager U.S. strategic regional interests and the safety of U.S. citizens living in Japan. Table 1. Source: Briefing by NRC Chaiman Gregory B. Jaczko to U.S. Senator Jim Webb, June 17, 2011. By this time the TEPCO officials who were pressing the case had lost much of their credibility and despite their protestations and efforts to maintain a facade of control, operational staff – hands-on engineers – fearing reprisals from their superiors, privately conceded that they too believed the pool had run dry. At best, TEPCO was sending mixed messages to the NRC, not only about the condition of the Spent Fuel Pool #4 but also about their willingness to share information and resources to develop a coordinated response. After inviting the NRC to join them at their Emergency Operations Center, an invitation that was acted on by the NRC, who mobilized staff to set up shop at TEPCO headquarters, senior TEPCO officials then pointedly withdrew the invitation, providing yet more evidence that TEPCO was internally divided and disorganized, calling into question their assessments. While this drama over the condition of Spent Fuel Pool #4 was playing out between the NRC and TEPCO (the first open disagreement between the US and Japan), the U.S. continued with their radiation surveys throughout the Tohoku region. The United States played an inordinately important role in measuring and compiling radiation data that nuclear authorities could use for assessing the Fukushima nuclear disaster. For the U.S., the organizations that initially played the most significant role in assessing the nuclear crisis were the NRC, which assigned over 200 staff stateside and sent a core team of 16 staff to Japan and Naval Reactors, which administers military platform nuclear reactors for the U.S. Navy, working in coordination with the U.S. Department of Energy. From the beginning of the crisis, Japan-based foreign embassies and their supporting governments overseas sought to establish lines of communication with TEPCO via the Japanese government, but they were often rebuffed and even when lines of communication had been established, there was little to relate, as even the Japanese government could not attain meaningful information from TEPCO, who continued to downplay the severity of the situation. Until a working relationship was developed with TEPCO, the only source of real-time meaningful information available to external entities that would allow for radiation assessment was a live stream of data on the MEXT website from fixed monitoring posts. In short proximity to the explosion of the reactor #4 building that was believed to destroy the spent fuel pool, higher than expected readings at the reactor site and TEPCO’s announcement that it was leaving, the DOE/USFJ radiation surveys measured a radiation hotspot at 38 kilometers distance from the Daiichi plant that was in excess of US Protective Action Guidelines (PAG). These PAG guidelines are utilized by the U.S. Department of Energy in coordination with the Nuclear Regulatory Commission for siting commercial nuclear reactors and are the fundamental reference point for public health impact during a nuclear disaster (See Table 1). Deploying to Japan from March 14 to March 28, THE U.S. Department of Energy National Nuclear Security Administration’s DOE/NNSA) Aerial Measuring System (AMS) conducted 100 survey flights, comprising 525 flight hours, using UH-60 Blackhawk helicopters, C-12 Huron airplanes and eventually transferred special detector pods that are mounted on the airplanes to ground teams for vehicle-based ground surveys. Along with these assets, the U.S. relied on ground surveys by teams of military personnel using specially equipped radiation monitoring backpacks in “picket fences” that were mapped onto the air and ground vehicle surveys. The U.S. government conducted more comprehensive radiation surveys than the Japanese government at this time, and crucially, the data was coalesced into integrated databases that could be assessed by their radiation authorities in Japan and abroad. While TEPCO authorities continued to put what increasingly appeared to be an implausibly optimistic spin on events, dissembled and stalled, fought with the Japanese government, frustrated and confused journalists with technically indecipherable data, the U.S. provided data to its various governmental agencies, shared this data with allies (including the Japanese government) and with TEPCO itself. They were not on the same page. Based on assessments of this data, which was more specific and nuanced than the information being provided by the Japanese authorities, the U.S. broke with Japan, expanding its evacuation zone out from the 20km (12 miles) threshold which it had temporarily shared until these discrepancies came to light, to 80km (50 miles). Japan had already moved the evacuation zone area several times in the first few days of the crisis, and incrementally continued to ratchet up the response, eventually stabilizing at 30km distance from the reactors, with specially designated non-concentric zones included to incorporate hotspot areas that were over the radiation threshold standard. These seemingly less conservative zones had been determined before 3.11, based on protocols established by the IAEA in 2007, which allowed discretionary zones to be established within these limits, based on the power-rating of the reactor, the nature of the accident, and other event-specific contingencies. Although the U.S. had dramatically expanded the evacuation zone and recommended to its citizens that they stay outside this 50 mile radius, this had little meaning outside the military: there were very few civilian American citizens living in Tohoku before the 3.11 disasters and what few remained soon left the region after the nuclear crisis developed. But for the military, this had implications for their strategic assets in Tohoku, where Japanese Self Defense Force bases are arrayed and linked into the USJF as joint task forces, from which tsunami relief efforts were being staged. In recognition of the threat the nuclear fallout posed to troops in this region, the U.S. distributed Potassium Iodide (KI) to its forces, monitored their troops’ exposure to make sure they did not exceed the protective action guideline limits and limited their time within the exclusion zone. U.S. military personnel working in the region were required to submit GPS data to indicate they had not strayed into the exclusionary zone unless specifically tasked to do so. Through the Tomodachi Registry, the U.S. government has provided specific information on dose exposures and, irrespective of its designed application, it provides publically available radiation measurement readings at specific rates, and at specific locales. By making this information publically available, it stands in stark contrast to how Japan has (not) made radiation data available to its own citizens. Although MEXT developed a radiation registry and made it available online, after a meeting of Fukushima prefectural authorities was convened to discuss this, the Mayor of Fukushima raised concerns that it would provoke fears by an uneducated public and the registry was taken down. Months later, the IAEA, perhaps as a compensation for this (the director of the IAEA is Japanese) and as a way to establish its authority in contrast to the Japanese ministries, made a similar radiation registry available online. In its official announcements, throughout the crisis the U.S. Embassy continued to assert that for those outside the Tohoko region, the situation was relatively safe. This position was called into question by the military’s recommendation on March 15, 2011 that personnel at Yokosuka Naval Base and Naval Air Facility Atsugi stay indoors (shelter in-place), and by the authorization on March 16 for the “voluntary military assisted departures” of government and Department of Defense dependents in specified areas. The U.S. government accounted for its advisories as “best-practices” recommendations made “out of an abundance of caution, and in order to enable U.S. government officials and the uniformed military to concentrate on the tasks at hand” (U.S. Department of State 2011). At the embassy and on the military bases, families were starting to panic after word filtered out that radiation levels were triggering alarms on the carriers, and as they heard their spouses relating backstage discussions that were fraught with tension and uncertainty about the public health implications of the crisis. At the Yokosuka naval base, a delegation of concerned mothers confronted the base officials, demanding that they be more thoroughly informed and be given support to leave, an eventuality that soon happened, but may have been accelerated by these public demands. Initially the plan to move the D.O.D. dependents was conceived as a recommendation with no direct financial support, but it quickly became evident that this would reflect class divisions and embitter those who could not afford the predatory pricing that developed as demand soared (at this time taxis were charging $2,000 for a ride from Yokosuka to Narita airport; plane tickets were going for up to $20,000). Thus, while the official stated position maintained that radiation was near background levels in these locations and thus no danger to public health, D.O.D. dependents, including the families of embassy officials in Tokyo and at the U.S. Consulate in Nagoya were given support (the flights were free of charge) to leave Japan. Through a mission named “Operation Pacific Passage” approximately 7,800 D.O.D. dependents (including about 1,200 families) left Japan, the most significant movement of U.S. citizens in Japan since the Pacific War. Within the social networks of expats in Japan, the “voluntary departures” were controversial. The D.O.D. dependents who took advantage of this opportunity to depart without cost were labeled “Fly-Jin” (a contraction variant of the Japanese word “Gaijin,” a derogatory slang for a foreigner) and were accused of using the crisis as an occasion to take a paid holiday while waiting out the crisis. This label had originated on Twitter feeds as a sarcastic pun, and came to be used more generally to describe foreigners who had abandoned Japan out of fear for personal safety. For the government and military authorities who arranged these departures, the operation was a pragmatic compromise that appeased the concerns of the panicked citizens under their protection. But by taking this step, the government was unambiguously demonstrating that they did not have confidence that these citizens were safe in Japan and thus needed to be hastily removed, irrespective of the cost or diplomatic implications. This perspective had gradually developed over the first week of the crisis, based on unexpectedly high readings coming from radiation surveys, which was compounded by the experience of dealing with the Japanese authorities. At J-Village, the staging ground in Fukushima for the crisis management of the disaster, the U.S. nuclear experts were encountering a chaotic environment, were witness to a lack of coordination among agencies, and were seeing indication that neither TEPCO nor the Japanese government fully appreciated the magnitude of the crisis and had a viable plan to effectively address it. While the U.S. military was recommending that several thousand staff be tasked to work on getting water on the reactors, using heavy equipment in a coordinated response between the military and civilian workers, TEPCO was devoting less than one hundred staff to diverse tasks and were taking remedial actions in response to a cascading series of setbacks, failing to anticipate events as they developed and only begrudgingly accepting help after their efforts had proved lacking. Well into April of 2011, the situation at the Daiichi plant continued to deteriorate. Even after water was put on the reactor cores, radiation continued to plume out of the plant: for fully three months this water continued to boil, releasing radioactive steam into the environment, while the area around the reactors was turned into a swamp, with contaminated water spilling into the ocean. On the front side of the accident TEPCO had downplayed the significance of the disaster, but even after the actions that would eventually prove effective were taken, the situation remained unstable. By the middle of May, 2011 TEPCO was able to demonstrate that despite evidence to the contrary, the water in the Spent Fuel Pool of reactor #4 remained intact, but by their own calculations, it had continued to decrease until the end of April, coming perilously close to uncovering the fuel rods (See Table 3). Throughout this time the reactors continuously plumed out radiation into the environment. When seen through the refracted gaze of the media, it seemed as though the radioactive plumes that escaped the Daiichi plant were severe, but episodic and limited. In fact, the plumes that made their way into the atmosphere after the venting and hydrogen explosions were peak releases, but they were merely steps above an already elevated level that fluctuated but never stopped. One way to visualize this is to imagine the plume as a spotlight that swept back and forth, continuously pluming out radioactivity in the direction that light was shone: as the wind shifted the plume would move, but it never stopped. The plume was unrelenting (and, arguably, still is today in another mode, as contaminated water leaks into the ocean), and as this radioactivity has been released into the environment, it has incrementally distributed cumulative doses whose consequences for public health were terrifying in the early days of the crisis and remain unclear and worrisome but may well be even worse in the long-term. We may never fully know the magnitude of the Fukushima nuclear disaster in this early phase of the crisis. For much of this time, the wind blew out to sea, diffusing the fallout into the air and the water, making it difficult to measure directly and with any certainty. In time we may infer from contaminated seafood the level of contamination, but even this is imprecise, as migratory fish and the bias of government ministries inclined to withhold or downplay bad news, and strict food standards remove contaminated foodstuff from the marketplace. Had the prevailing winds blown inland, it would have been an entirely different disaster: the plume that rendered the area Northwest of the Daiichi plant uninhabitable (where Namie and other evacuated villages are located) was only part of one afternoon on one day. The high levels of contamination in these isolated hotspots are by now well known and much measured; what is not generally recognized is what radiation monitoring was revealing to government agencies that were mapping the plume elsewhere, including at distances much farther from the plant into the Kanto plain and Tokyo: the U.S. Embassy is located in Tokyo. Taken as a snapshot of a moment in time, the numbers were reassuringly well below the maximum allowable protective action guideline dose set forth by the U.S. Environmental Protection Agency. What this analysis could not account for, however, was the long-term impact of continuous releases from multiple reactors. Although the NRC’s RASCAL program and NARAC’s plume projection models – as with SPEEDI, a comparable system – are important tools used within the U.S. nuclear industry, they have inherent limitations that could not accommodate the multiple contingencies of shifting weather patterns disseminating fallout from multiple sources. Using source-term assumptions, the system estimates where a given release will go once it is out in the environment, but these models are not derived from actual radiation measurements taken in situ where the actual depositions reside. Ultimately these models are diagnostic tools using sophisticated computer software programs that are based on a number of inferential assumptions, and are correspondingly imprecise, ambiguous and open to interpretation. In the Fukushima nuclear crisis, atmospheric modeling systems were useful, but had inherent limits that could not accommodate a multiple-day, multiple-release scenario. For a single reactor accident such as Three Mile Island, the system can more accurately model a release such as the venting of a reactor over a limited period of time, or a catastrophic release such as the hydrogen explosions that happened at the Daiichi facility. But beyond such a limited time frame, the system is overwhelmed: for the Supercore analysis, NARAC compressed longer-term releases into 24 hour periods of time, and completely disregarded food ingestion pathways, which require longer-range analysis that includes agriculture areas and a more comprehensive array of different isotopes. Alongside the NARAC/NRC runs, similar atmospheric modeling was conducted by the U.S. Defense Threat Reduction Agency (DTRA), and by France, Canada and the United Kingdom,18 but as with the NRC/NARAC systems, these agencies all used source-term derivatives and did not conduct actual on-the-ground radiation measurement. Given the changing situation at the Daiichi plant and a range of variation on what these atmospheric modeling programs were indicating as they were updated to account for the constant shift in weather patters, this led to ongoing debates among even the most experienced radiation experts within the government agencies about just how bad the crisis had become, and where it was headed. The U.S. military and Department of Energy, however, continued to compile real-world measurements throughout the crisis, not only in the Tohoku region, but in Tokyo and at the military bases throughout Japan. These measurements indicated a more ominous outcome than the source-term models were suggesting. On March 21st, shortly after PACOM initiated the military assisted departures for D.O.D. dependents at the bases, a hotspot reading half-way between Fukushima and the Yokosuka military base was so high that Naval Reactors, in this context one of the primary organizations responsible for radiation assessment for the Department of Defense, recommended that military and civilian dependent personnel within a 200 mile (322km) radius be offered KI and be included in military assisted departure (essentially, the recommendation was to support KI distribution and evacuations of D.O.D. dependents up to 200 miles distance from the Daiichi Plant). This drove decision making at this crucial moment, giving reason for the distribution of Potassium Iodide (KI) and further reinforcing the rationale for the military assisted departures (Yokosuka is 163 miles from the Daiichi NPP). With only hours before the plume would hit Yokosuka, the debate focused on the immediate necessity of distributing KI to D.O.D. dependents. While this debate continued, it was determined after putting the data through a peer review process and comparing this to the radiation survey data in Tohoku (extrapolating readings from near the reactors to correlate with more distant readings as in Yokosuka), that this unexpectedly high reading was an unrepresentative outlier, owing to a measurement error or a transient spike from random particulate fallout. As had been the case with the reactor venting, the hydrogen explosions and the spent fuel pool debate, this unexpectedly high reading alarmed the U.S. authorities and provoked them to action. Even though this particular reading was found to be in error, it highlighted the prospect of exposing, especially, pregnant and lactating females, infants and small children to thyroid dose rates above the established DOE Protective Action Guideline threshold. Despite ultimately being proven incorrect, this dramatic reading profoundly influenced the decision making and plicy priorities of the U.S. Pacific Command at this crucial period of time. The fundamental point pushed by the Navy to warrant its more conservative recommendations was the cumulative dose rates that were accruing over time. Even 10 days into the disaster, the situation was continuing unabated, exposing D.O.D. personnel and their dependents to incrementally accumulating dose rates that would conceivably pass the maximum PAG threshold for public health over an extended period of time. With this in mind, the U.S. government decided to distribute KI and support departures because even if the dose rates at this time were still inside the DOE guidelines, if the exposure rates continued as measured they would eventually hit and pass the PAG limit, and perhaps continue to accumulate even further thereafter. Despite the cost and inconvenience, civilian expats might find their way to Western Japan to wait out the crisis, or leave Japan altogether, but the military were parked at the bases and not going anywhere: in a long-term nuclear event they faced the prospect of continuous exposure. As a result of these concerns, the U.S. military in Japan implemented preconceived “Emergency Action Plan(s),” in the U.S. Embassy and at the military bases. These formally scripted plans are invoked to protect classified documents that cannot be left behind from disclosure. At the U.S. Embassy in Tokyo, industrial grade shredders were used continuously for four days, destroying classified documents dating back a decade19. At the military bases burn bags were used to destroy documents and equipment such as classified servers and cryptography machines were physically destroyed.20 The initiation of Emergency Action Plans at the bases and in the U.S. Embassy in Tokyo was a stepped procedure of ascending priority, beginning with destruction of materials handled by non-essential staff who were allowed to leave as part of Operation Pacific Passage. As a first step in the potential withdrawal of U.S. military and diplomatic staff from Japan, this would have escalated to include documents and materials utilized by essential personnel, had they eventually been required to exit Japan in a worse case scenario. As ominous as this may seem, Emergency Action Plans are commonplace within the military culture: every branch employs this protocol as a means to prevent confidential and classified materials from being compromised when situations develop that compel departure from a location where military and intelligence assets are arrayed. In the Fukushima nuclear crisis, the fact that Emergency Action Plans were implemented at the military bases and the embassies at the height of the crisis emphatically demonstrates two things: that for a period of several days the U.S. government believed that departure from Japan was imminent and secondly, that the situation was so volatile that they thought it prudent to take immediate action to protect their assets. At this same time, inside the U.S. Embassy in Tokyo a team was tasked to draw up plans to put tens of thousands of American citizens on the decks of the aircraft carriers to get them out within hours (there were not a sufficient number of available flights to get such a large number of citizens and Department of Defense dependents out quickly if it had proved necessary). The German government and other embassies in Japan have been subjected to criticism for moving their diplomatic corps and embassy operations to Western Japan while other foreign embassies held the line in Tokyo,20 but backstage and out of view of public scrutiny, the U.S. Embassy made specific plans to move to Osaka (two staff from each section were assigned to support embassy functions if this were to have proved necessary). This was not unique to the U.S. government: at the same time international cooperation was ramping up for tsunami relief, foreign embassies in Japan began to discuss evacuation of foreign nationals to escape the nuclear fallout while managing the perceptions of their staff and Japan-based constituents as the situation continued to deteriorate with no respite in sight. This was a tricky balance, and it took considerable finesse to implement procedures out of line with the Japanese official response while seeking to avoid the diplomatically troubling insinuation that these policies were an implicit critique of the Japanese government’s crisis management procedures. In retrospect, the various protective measures taken by the U.S. Government – to distribute KI to its citizens, to pay for assisted departures of D.O.D. dependents and possibly relocate the embassy and perhaps leave Japan altogether – may seem to have been an over-reaction based on miscalculation. For critics of these decisions they may even be seen as a species of ill-advised panic mongering characteristic of anti-nuclear activists and tailor-made for the tabloid press. This was not, however, the way this was conceived by the most experienced and knowledgeable U.S nuclear authorities who were the most influential voices at the height of the crisis, and whose recommendations were translated into policy. With the clarity of hindsight, the grave concern and subsequent political contretemps that accompanied them might have been avoided if the press of events at the time did not compel immediate action. But from the vantage point of the U.S. military and government authorities, the situation at the time was so uncertain, and the stakes of inaction so high, that “getting in front” of the worst case possibility and being proactive to take these controversial actions was seen, ironically, as the most cautious response. As we look to the early days of the crisis, it is tempting to place a shelf life on panic-oriented risk discourses and fix these frameworks of interpretation in time, to conclude that after a somewhat hysterical first few weeks, the crisis abated, taking with it these unreasonable claims. However, over time critical media coverage has led to a gradual amplification of risk about nuclear danger that has given credence to claims previously taken as an over-reaction and panic. These adjustments have happened incrementally as stories have broken in the media that were previously known only to insiders, and as various government agencies and independent panels have submitted reports, all of which reveal more nuanced information about particular episodes in the crisis. This information has provided ammunition to critics (and little comfort to industry supporters), as the overall picture that emerges is one of inadequate preparation, well-intentioned ineptitude, poor communication and tone-deaf politics. These evaluations, coming from various parties distributed across the political spectrum, map onto anti-government political agendas, lending credence to anti-nuclear activists, who had anticipated such a crisis. Although the tsunami may well have resulted in greater immediate impact on Japanese society in terms of the environmental and economic effects, the meaning and significance of the nuclear crisis for Japan remains uncertain. Because this was a uniquely international event, projecting fears of radiation exposure implausibly far beyond Japan’s borders, cultural frames of reference came into play, leading to selective perception about the nature of the accident and its presumed effects. The media guided these discourses down characteristically narrow paths, filtering information to construct notions of risk, which shaped public perception and influenced the action of decision-making elites. The crisis stoked fears of nuclear energy run amok, and the media helped construct a narrative arch that amplified perceptions of risk in the most melodramatic terms. Given the magnitude of this crisis, it seems that in the aftermath of 3.11 all roads run through Fukushima, as scholars attempt to untangle the web of associations related to this unprecedented series of events. As a means of studying Japan, the Fukushima nuclear crisis affords opportunities to examine cultural traits that are embodied in institutional structures, and find expression in public politics. Public policy is based on political discourse, and in this crisis, perception drove decision-making, creating a politics of fear, which has transformed Japan. The media helped construct this interpretative frame through its coverage of the nuclear crisis, and after a bad start, has become more critical of corporate malfeasance and political corruption. The foreign press has been alarmist and at times histrionic about the nuclear crisis in Japan, but it has brought issues of political corruption to the forefront and helped focus the debate on politics in a way unfamiliar to the Japanese domestic press. This has influenced the Japanese media’s coverage, which has altered its tone and perhaps even changed its priorities. The “Kisha-Club” press system in Japan, whereby reporters pool information and rely on official public statements as the primary basis for their stories, is increasingly being seen as complicit in the nuclear crisis, since it disregarded critical information when it most counted and failed to hold the authorities accountable for their actions. Although the Japanese press echoed the statements made by TEPCO and the government in the days immediately after the crisis began, as more troubling information leaked out, it gradually aligned with the foreign press on a number of issues central to this experience. These include a withering indictment of the collusion between the Japanese political bureaucracy and the energy utilities, questions about the truthfulness of government and industry spokesmen, challenges to assurances about food safety, and an increasingly critical assessment of the viability of nuclear energy. Now that enough time has transpired for watchdog agencies to make their assessments and for previously hidden information to come out (via investigative journalism and disclosure by disgruntled former employees), the Japanese media are retrospectively framing events in the more strident terms that we have associated with the panic-driven foreign press. By summer of 2011, with information in hand that the reactors had melted down, and former government officials confirming their worst fears, a consensus emerged that Japanese government authorities, and especially TEPCO, did not have control as they had asserted, and the situation was much worse than these reassurances indicated. This picture gradually started to gain focus and achieve official mainstream sanction through independent reports and interviews with government officials, but in the first few weeks of the crisis, as fears were at their peak, there was still a highly contentious debate about the magnitude of risk. Any notion that these concerns were irrational would seem to be unfounded, based on the available evidence. Now that the situation has relatively stabilized, people in Japan remain anxious, especially in Tohoku, about important and entirely reasonable concerns related to health and well being, and those who have been displaced from their homes because of the nuclear accident may never return. It is difficult to overstate the impact this dual crisis will have on Japan in this generation. Now that the initial crisis phase has passed, the focus has turned to reconstruction and reform, but on the ground in the Tohoku region people face chronic uncertainty about the safety of food and the long-term effects of low-level radiation exposure. The government’s initial response was discouraging, and the nuclear village, when all is said and done, may remain substantially intact. But social activism is on the rise, bringing previously disengaged citizens into political movements that were previously the domain of activists, who are now being vindicated by recent events. The author wishes to thank Maho Cavalier, Drake Crane and Millie Nishikawa for their assistance in the research that helped produce this paper. Kyle Cleveland is Associate Professor of Sociology at Temple University’s Japan Campus in Tokyo and was the founding Director of TUJ’s Institute of Contemporary Asian Studies (now Associate Director), for which he organizes a lecture series, academic conferences and symposia. As TUJ’s Study Abroad Advisor, he was involved in the university’s crisis management, serving as a liaison to U.S.-based study abroad providers, and at the height of the nuclear crisis chaperoned an emergency evacuation flight out of Japan with international students. He is writing a book on the political dimensions of radiation assessment in the Fukushima nuclear crisis, examining how foreign governments in Japan responded to the crisis. Akagawa, Roy K. (2012, February 29). Interview/Yoichi Funabashi: Fukushima Nuclear Crisis Revealed Japan’s Governing Defects. The Asahi Shimbun. Bader, Jeffrey A. (2012, March 8). Inside the White House During Fukushima: Managing Multiple Crises. Foreign Affairs Magazine. Council of Foreign Affairs. Blustein, Paul (2013, September 26). Fukushima’s Worst-Case Scenarios: Much of What you have heard about the Nuclear Accident is Wrong. Slate Magazine. Defense Threat Reduction Agency (2012, December). Radiation Dose Assessments for Shore-Based Individuals in Operation Tomodachi Technical Report. Dose Assessment and Recording Working Group: Assistant Secretary of Defense for Health Affairs. Defense Threat Reduction Agency: Fort Belvior, Virginia. El-Jaby, Ali (2011, August 10). Fukushima Daiichi NPP Event and Associated Radioactive Source Term – CNSC’s Initial Response. Presented at 2011 WNU Summer Institute. Canadian Nuclear Safety Commission. Fackler, Martin (2012, July). Credibility Lost: The Crisis in Japanese Newspaper Journalism after Fukushima). Futaba Shinsho. Feely, Matthew S. and Paul Ingram (2013, January 29). Operation Tomodachi. Columbia Caseworks ID# 13401. Columbia Business School. Feickert, Andrew and Emma Chanlett-Avery (2011, March 22). Japan 2011 Earthquake: U.S. Department of Defense (D.O.D.) Response. Congressional Research Service. Funabashi, Harutoshi (2012). Why the Fukushima Nuclear Disaster is a Man-made Calamity. International Journal of Sociology. No. 21. The Japan Sociological Society. Gardner, Eric (2011, March 17). Military Dependents Voluntary Evacuation from Japan Announced. Naval Air Facility, Atsugi Japan, Press conference. Commander Fleet Activities, Okinawa. Grange, Arnaud de La (2011, March 21). The Japanese Surprised by the Exodus of French Expatriates. Le Figaro. Greenpeace International (2012, February). Lessons from Fukushima. Hayashi, Yuko (2011, August 16). How Japan Stumbled in Forecasting Fallout in One Town. The Wall Street Journal. International Atomic Energy Agency (2007). IAEA Safety Glossary: Terminology Used in Nuclear Safety and Radiation Protection. Vienna: International Atomic Energy Agency. Itabashi, Hiroyoshi and Hidefumi Nogami (2013, January 28). U.S. frustrated with Japan’s initial response to Fukushima. Prometheus Trap: Asahi Shimbun. Izumi, Tanaka (2011, May 1). 20 Millisierverts for Children and Kosako Toshiso’s Resignation. Japan Focus. Kelly, Tara (2011, March 15). U.S. Military Exposed to Radiation in Japan, though Officials Say Danger is Minimal. Time Inc.
Kemeny, John G. (1979, October). Report of The President’s Commission on the Accident at Three Mile Island: The Need for Change: The Legacy of TMI. Washington, D.C.
Kingston, Jeff (2011). Ousting Kan Naoto: The Politics of Nuclear Crisis and Renewable Energy in Japan. The Asia-Pacific Journal: Japan Focus. Kurokawa, Kyoshi (2012, July). The Official Report of The Fukushima Nuclear Accident Independent Investigation Commission. The National Diet of Japan. Kushida, Kenji E. (2012). Japan’s Fukushima Nuclear Disaster: Narrative, Analysis, and Recommendations. Shorenstein APARC Working Paper. Stanford University. Lochbaum, David and Edwin Lyman (2014). Fukushima: The Story of a Nuclear Disaster. New Press. Lyons, C. and Colton D. (2012). Aerial Measuring System in Japan. Health Physics. Vol.102, No. 5. Moroney, Jennifer D. P., et. al. (2013). Lessons from Department of Defense Disaster Relief Efforts in the Asia-Pacific Region. The Rand Corporation: National Security Research Division. Nogami, Hidefumi (2013, February 1). Prometheus Trap (3): Japanese Ambassador Felt Something Not Right Before State Department Meeting. The Asahi Shimbun. Nuclear Regulatory Commission (2011, March 13). Freedom of Information Act document NRC-944. Perrow, Charles (1999). Normal Accidents: Living With High-Risk Technologies. Princeton University Press. Rebuild Japan Initiative Foundation (2012, March 11). Fukushima Nuclear Accident Independent Investigation Report. Tokyo: Discover 21. Samuels, Richard J. (2013). 3.11: Disaster and Change in Japan. Cornell U. Press. Sasakawa Peace Foundation (2012). The Fukushima Nuclear Accident and Crisis Management: Lessons for Japan-U.S. Alliance Cooperation. Shikata, Noriyuki (2011, April 17). Personal Communication. Slavin, Erik (2011, April 11). Families Frustrated by Lack of Answers from Yokosuka Hospital. Stars and Stripes. Stohl, A., et. al. (2012, March 1). Xenon-133 and Caesium-137 Releases into the Atmosphere from the Fukushima Dai-ichi Nuclear Power Plant: Determination of the Source Term, Atmospheric Dispersion, and Deposition. Atmospheric Chemistry and Physics, Vol. 12. Till, John E. (2003). A Review of the Dose Reconstruction Program of the Defense Threat Reduction Agency. Committee to Review the Dose Reconstruction Program of the Defense Threat Reduction Agency, National Research Council. The National Academies Press. United States Nuclear Regulatory Commission (2011, October). Expanded NRC Questions and Answers related to the March 11, 2011 Japanese Earthquake and Tsunami. Wambach, Jessica (2012). Civil-Military Lessons Learned in the Response to the 2011 Great East Japan Earthquake. Liason: A Journal of Civil-Military Humanitarian Relief Collaborations, Vol. 5. Center for Excellence in Disaster Management & Humanitarian Assistance (COE-DMHA). Wang, Dean et. al. (2012, November). 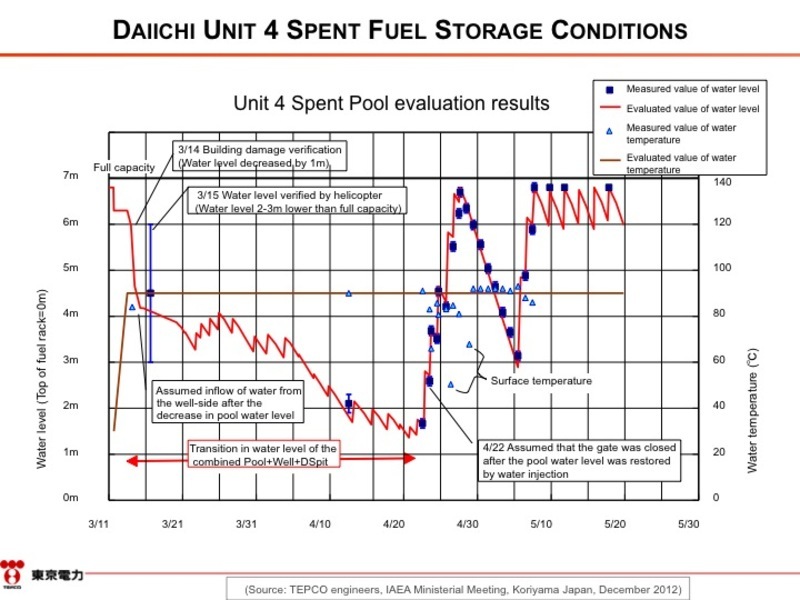 Study of Fukushima Daiichi Nuclear Power Station Unit 4 Spent-Fuel. Nuclear Technology, Vol. 180, No. 2. American Nuclear Society. Weightman, John (2011). Japanese earthquake and tsunami: Implications for the UK nuclear industry: Final Report. HM Chief Inspector of Nuclear Installations September 2011. Office for Nuclear Regulation. 1 Sposato, William (2011, October 22). Media Reporting and Risk Management After the March 11 Disaster. Japan Echo Symposium. Tokyo: Japan Echo Foundation. 2 Baba, Tomatsu (2013, July). Personal Communication. As mayor of Namie, one of the towns most affected by the radiation fallout, Baba-san remains embittered toward the national government and has threatened litigation due to the public health implications for his community. At the same time, he fields continuous demands by citizens who blame him for not providing Pottasium Iodide at the crucial moment, even though this was available for distribution. But as with the SPEEDI data, with no government directive nor timely intervention by knowledgeable authorities, he remained – like many prefectural authorities in Fukushima – without guidance or support and was left to improvise in a chaotic environment. 3 Willacy, Mark (2012, January 20). Japan ‘Betrayed Citizens’ Over Radiation Danger. Australian Broadcasting Company. 4 Onishi, Nori (2012, February 20). Personal Communication. 5 Hayano, Ryugo (2012, March 3). Personal Communication. 6 Shikata, Noriyuki (2011, April 17). Personal Communication. 7 Sposato, William (2012, February 9). Personal Communication. 8 Neidhart, Christoph (2012, February 7). Personal Communication. 9 Nuclear Regulatory Commission (2011, March 13). Freedom of Information Act document NRC-944. 10 Suzuki, Tatsujiro (2012). Personal Communication. 11 Multiple sources in the USFJ/Pacific Command. Confidential Personal Communication. 12 Doane, Magaret (2011, March 14). OIP Analysis/Guidance No. 2. Enformable Nuclear News. 13 Casto, Charles A. (2012, July 7). Personal Communication. As the lead person tasked with overseeing the U.S. response in Japan, Casto was uniquely suited for the Fukushima crisis. At the time of the accident, he was deputy regional administrator of the NRC’s Center of Construction Inspection, and earlier in his career had worked in five units with a General Electric Mark 1 design (there are 23 U.S. reactors with this Mark 1 design), and he was plant manager of the Browns Ferry site in Alabama, a three unit site similar in design to the Fukushima Daiichi plant. After spending 11 months in Japan working the Fukushima crisis as the chief representative of the U.S. government for the nuclear industry and the nuclear response team leader, Casto was appointed the regional administrator of the NRC’s Midwest office, responsible for regulating 16 commercial power plants in seven states. Before retiring from the NRC in 2013, he received the Presidential Distinguished and Meritorious Rank Awards from President Obama, for his contribution to the U.S. government during the nuclear crisis. 14 United States Nuclear Regulatory Commission (2011, October). Expanded NRC Questions and Answers related to the March 11, 2011 Japanese Earthquake and Tsunami. Washington: U.S. Nuclear Regulatory Commission. 15 Onishi, Nori (2012, February 20). Personal Communication. 16 Cooper et al v. Tokyo Electric Power Company, Inc. et al. (2013, April 1). Case Number: 3:2013dcv00773. California Southern District Court: San Diego Office. Since the onset of the nuclear crisis, the number of U.S. Navy plaintiffs against TEPCO has grown, claiming personal injury directly related to radiation releases in the first few days of the crisis. Although the initial case was dismissed on jurisdictional grounds, no finding was made on substantive merit, thus leaving open the possibility of appeal and future litigation. 17 Although source term analyses are qualitatively different from those based specifically upon measured radiation levels, the ultimate interpretation of these various sources used by the organizational elites who made the final call and translated this into policy were a composite of all available sources of information. This meta-analysis was complicated by political concerns, organizational priorities and differences in perception among the select handful of elites who ultimately made the final determination. 18 Beddington, John (2013, February 27). Personal Communication. As the chief scientific advisor to the British government during the Fukushima nuclear crisis, Sir John Beddington’s briefings at town hall meetings quickly went viral in social media networks to reassure the expat community in Japan that the public health risk was not as ominous as the mainstream media was asserting. Alongside U.K. Ambassador to Japan, Sir David Warren, Beddington’s public statements were the model of diplomatic acumen, but they were based on source-term analyses and did not track with the assessments being made by the U.S. military and Department of Energy’s on-the-ground radiation surveys, which indicated a more ominous possible outcome. 19 It is important to note that the content and relevance of these materials specifically to the Fukushima nuclear crisis has not been established as a matter of public record, due to their inherent status as confidential and classified materials: the documents may have been comprised of historical documents, intra-office communication and other materials that are classified, but not necessarily directly (or exclusively) related to this particular crisis and series of events. 20 Multiple confidential sources in the USFJ/PACOM. This decision was made as the result of consultation with nuclear authorities in Washington, D.C. (including former military officers with high-level nuclear expertise) who comprised an ad hoc group of advisors to the State Department and President Obama, with input from the Department of Energy, the Nuclear Regulatory Commission and the U.S. Pacific Command. 21 Stanzel, Volker (2012). Personal Communication. As German Ambassador to Japan during the crisis, Dr. Stanzel was embattled by a more strident public than most of the foreign embassies endured at this time. The German reaction to the nuclear crisis was considered an outlier among the other foreign embassies, a response that was influenced by domestic anti-nuclear sentiments back in Germany, which compelled the ruling government to accelerate recently announced plans to discontinue the use of nuclear energy. These domestic pressures contributed to the Tokyo embassy’s decision to move to Osaka, causing some resentment among the other foreign embassies, who maintained a diplomatic facade during the first few days of the crisis. Fully six months after the crisis began, the German Embassy remained understaffed due to concerns about the nuclear situation, with ten posts (about one fourth of its diplomatic staff positions) remaining unfilled, as existing staff fled to Germany and refused to return, and prospective candidates refused to come while the situation was still uncertain. To help allay concerns, the German Embassy installed a full-time radiation expert in the Tokyo embassy (rotating in several experts over the following year).